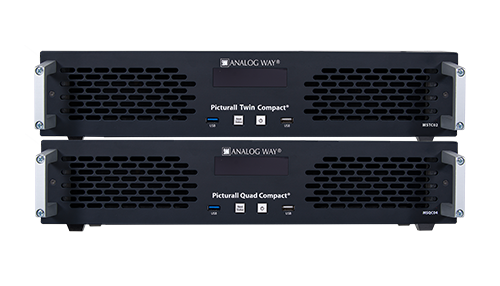 Analog Way announces new compact versions of its Picturall Quad and Picturall Twin media servers, delivering the same class leading playback performance in a 2RU ruggedized chassis. The Picturall™ media servers' compact versions will be presented at Prolight + Sound 2019 in Frankfurt (Germany), along with the new LivePremier™ series, the most powerful live presentation systems ever built (Analog Way booth, Hall 4.0, B28). Picturall Quad Compact and Picturall Twin Compact feature the latest software version 2.7 released in March for the whole range of Analog Way Picturall™ media servers. Among other enhancements, this new version adds support for the HAP video codec family and introduces a new high-performance proprietary video codec named AWX, specifically designed by Analog Way to offer optimized playback for very high resolution and bit rate content for multi-screen and large-scale LED wall applications. The heavy-duty Picturall Quad Compact 4K media server is well suited for large-scale events and installations requiring high levels of performance and stability. Picturall Quad Compact offers four 4K@60Hz 10-bit outputs and can play back up to 12 layers of full HD or 3 layers of 4K@60hz video with the new AWX codec. Designed for medium-sized events and installations, Picturall Twin Compact is a powerful and cost-effective 4K media server with two 4K@60Hz 10-bit outputs, delivering a playback performance of up to 8 layers of full HD or 2 layers of 4K@60hz video with the new AWX codec. Both compact models offer up to 4 optional inputs (HDMI 1.4, HDMI 2.0, 3G-SDI or DVI) as well an optional two-channel audio interface with balanced XLR outputs. They share the same core features as their larger siblings in the Picturall™ series of media servers and combine a robust hardware platform, a rock-solid Linux-based software engine, flexible control solutions and the easiest setup in their class making them the ideal solutions for driving corporate events, live shows, high-end theatre productions or large-scale digital signage projects. Picturall Quad Compact and Picturall Twin Compact will be presented at Prolight + Sound, from 2 to 5 April 2019 in Frankfurt, Germany, along with the LivePremier™ presentation systems. LivePremier™ is a full range of mission critical 4K/8K multi-screen presentation systems and videowall processors specifically designed to deliver uncompromising presentation experiences to high-end staging and premium system integration. Analog Way booth B28 is located in Hall 4.0.